As the camera slowly panned out, the source of his discomfort was revealed: he was the sole Islamist standing before a veritable coterie of Egyptian civil, political, religious and, most importantly, military leadership, and they were all seeking to dislodge the country’s elected president. The day was July 3, 2013—President Mohamed Mursi’s last day in office. In fact, that day may prove to be the last day that any Islamist holds the top position in Egypt in the near, and perhaps far, future. More than two months later, there are two questions that must be asked: Has Egypt been rescued from the prospect of civil war? And just what motivated Egypt’s second party to turn on the standard-bearer of Egyptian political Islam and their sometime ally, the Muslim Brotherhood? The answer is simple, and coincidentally it also explains the presence of every other figure at that fateful press conference in which Gen. Abdel-Fattah El-Sisi announced Mursi’s ouster: Fear over the direction in which Egypt was heading under Mursi, sprinkled with some self-interest and served with a side-order of political opportunism. We must dispense with the myth that because the Salafists and the Muslim Brotherhood are both Islamists they are somehow comrades-in-arms. While they certainly share some interests, they are also largely competing against one another for the same support base. Egypt’s native Muslim Brotherhood has traditionally ruled the roost, even though it has been outlawed for most of its eighty-year history. The ultraconservative Salafists, on the other hand, are relative newcomers to the Egyptian scene in general and the political scene in particular. The Salafists, who adhere to a strict, fundamental interpretation of Islam harking back to the seventh and eighth centuries, share a number of ideological beliefs with the Muslim Brotherhood, including viewing the Qu’ran and Sunnah as the sole reference point for all aspects of life, including politics. In contrast, the Muslim Brotherhood has been a political organization since its very inception, and therein lies its major strength. 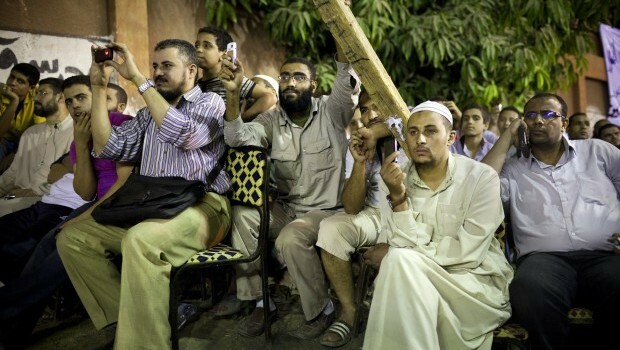 While the Salafists predate the Brotherhood, they were not organized until very recently; The Muslim Brotherhood has always been the most organized force on the ground in the modern Republic of Egypt, allowing them to secure strong grassroots popularity at home and abroad. While its organization has been the Brotherhood’s biggest strength, it has also proved a major weakness in terms of the manner in which the group administrated, or shall we say failed to administrate, the country under Mursi’s tenure. Ironically, the Muslim Brotherhood’s very existence caused a radical change in the nature of Salafi organizations and Salafists. The term “Salafi” today has become almost synonymous with terrorism, with so-called Salafists aspiring to be shoe- and underwear-bombers. However, this ultraconservative doctrine did not—and arguably still does not—advocate violence as a tool for change. It was the Muslim Brotherhood’s Sayyid Qutb who developed and popularized the concepts of takfirism, the practice of one Muslim declaring another Muslim an unbeliever, and Dar Al-Jahiliya, a division of the world in Islam, with Qutb claiming that the modern Islamic Umma (world community) had reverted to a state of pre-Islamic ignorance, invaliding a number of until then cast-iron Islamic guidelines regarding warfare. Both of these concepts are major pillars in the rise of Islamic terrorism and Al-Qaeda. As for their interactions following the January 25 revolution, the Brotherhood and Salafists initially competed against one another. The Freedom and Justice Party and the Salafist Al-Nour Party, the two largest blocs in Egypt’s 2012 parliament, eventually reached a somewhat tense post-revolution alliance, particularly over Egypt’s nascent constitution. It was this alliance in the much-derided and Islamist-dominated constitutional drafting committee that led to Egypt’s controversial constitution that is again in the process of being amended. However, this cooperation proved to be an exception, and the Muslim Brotherhood and Salafists—especially the Al-Nour Party—have largely been at odds since the Arab Spring, and particularly following the election of the Brotherhood’s Mohamed Mursi. The Al-Nour Party initially backed Muslim Brotherhood defector Abdel Moneim Aboul-Fotouh for president, before throwing its weight behind Mursi in the presidential run-off to ensure that Mubarak stalwart Ahmed Shafiq did not come to power. After the ratification of the 2012 constitution, the Brotherhood–Nour pact came apart, with the Salafists criticizing Mursi for his controversial constitutional declaration and the Brotherhood’s monopolization of the apparatus of power. Mursi, as ultimately evidenced by his ouster, was not one to back down from a fight, escalating the political spat with the second-largest bloc in parliament and eventually leading to Murra’s unexpected presence at Sisi’s press conference. Unsurprisingly, the Al-Nour Party did another about face less than a week later, after the outbreak of nation-wide violence in Egypt. The party announced its withdrawal from Sisi’s road map after the massacre of Islamist supporters of the former president outside a Republican Guard headquarters in Cairo. With the Muslim Brotherhood’s very existence as a legal organization in Egypt under threat this week following disputed reports that the governments intends, or indeed already has, dissolved the Brotherhood’s status as a non-governmental organization, what lies ahead for the Nour party? Squeezed on one side by the secular and liberal forces it allied with to oust Mursi, and despised by the Muslim Brotherhood and its supporters, the Salafists today find themselves in an awkward position. With just one representative in the secularist-dominated body tasked with amending the constitution, the Al-Nour Party will most likely find its voice drowned out in post-post-revolutionary Egypt.